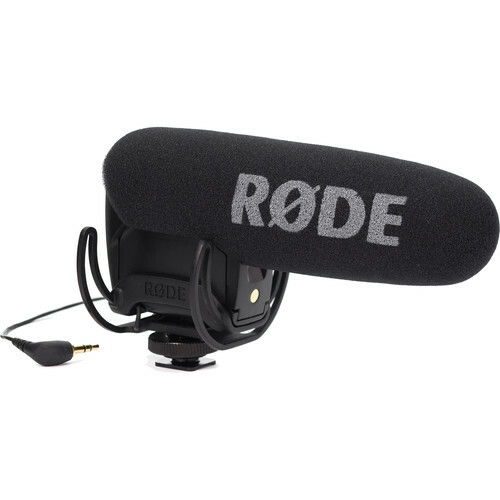 As one of the most popular compact shotgun mics that RØDE makes, the RØDE VideoMic Pro has been relatively unchanged since it was introduced back in 2013. Filmmakers looking for a smaller, less intrusive audio footprint for shooting of wedding videos and interviews, came to the VideoMic Pro, but were soon disappointed by the rubber band-like shock design because the rubber bandswould stretch out with constant use and need to be replaced. RØDE even issued free replacement rubber bands which they had redesigned to make them last longer. But the design was flawed and RØDE simply needed to go back to the drawing board. What could they do to fix the shockmount design and still keep the higher quality sound recording capability of the VideoMic Pro? Well, it turns out the answer was in it’s big brother, the RØDE VideoMic and its Rycote Lyre Suspension. The VMP-R VideoMic Pro with Rycote Lyre Suspension Mount uses a supercardioid condenser shotgun microphone that’s been redesigned to be larger and provide higher audio sensitivity without bringing more noise to the party. The result, according to RØDE, is a wider dynamic range with crystal clear audio capture. Let’s take a look and see how they did. Don’t confuse the VideoMic with the VideoMic Pro. 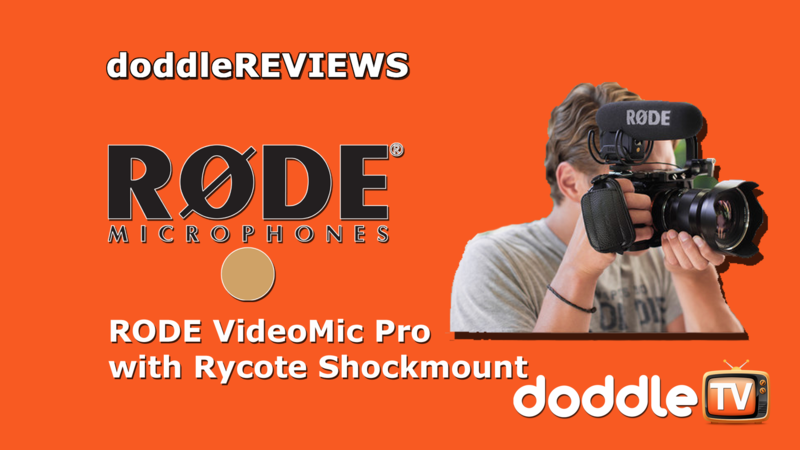 Although the VideoMic has a red Rycote lyre shockmount, it’s also much larger. I have one and really like it for recording of my son’s marching band performances. Both share a similar SuperCardiodoid Microphone and Line Gradient Condenser that provides the same 40 Hz to 20 kHz Frequency Response. But the VideoMic Pro offers a few things that the VideoMic doesn’t, and vice versa. The VMP-R has control over sound levels thanks to the three position level control and a dual high-pass filter switch that compensates for room ambiance and noise below 80Hz. 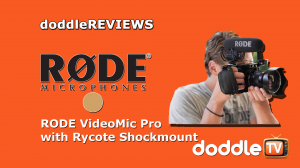 So rather than redesign the entire VideoMic Pro itself, RØDE merely designed a new Rycote lyre shockmount to replace the rubber bands. It’s really what the VMP needed to be from the outset. With a new shockmount in place, RØDE decided to make the VMP-R a bit larger to increase the performance of the microphone, and yet still stay within the envelope of that compact audio footprint on a DSLR. And the results are pretty slick. There is a bit of a downside for existing VideoMic Pro users however. 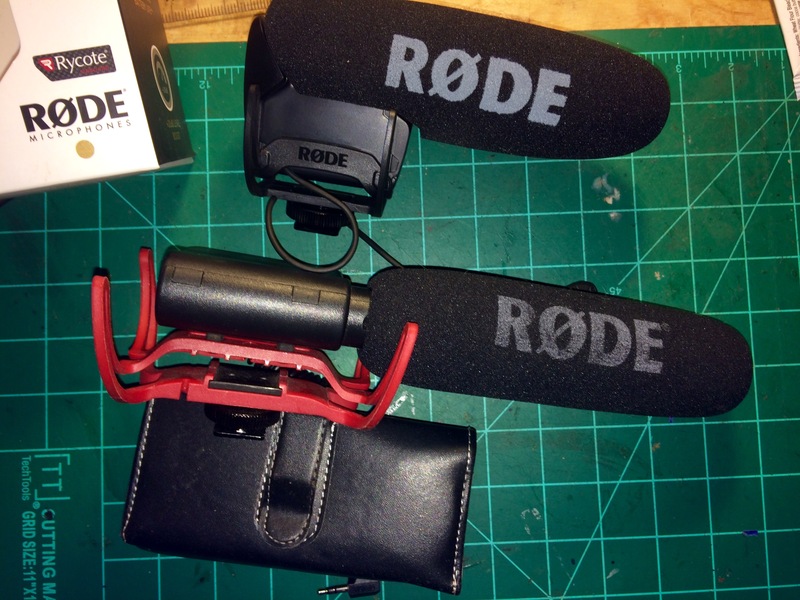 RØDE made no plans to offer an upgrade kit for the Rycote shockmount since they made the VMP-R a bit larger. As such, users of the VMP will not be able to upgrade. They also won’t be able use any existing accessories like the original Furry deadcat windscreen. I’m sure you could maybe make some modifications to it to put it on, but you’re much better off just laying down the extra $25 and save yourself the trouble. My first issue with the VideoMic Pro is the battery compartment, chiefly the slide up door itself. It’s the same door design as the original VMP and it’s just plain cumbersome. Placed in front and under the shotgun portion of the mic itself, users have to slide up and then down to open it. Try and keep the door there, because if you take it off, it’s a heck of a job to get it back on. In fact, I had to remove the foam windscreen in order to properly align it and it still took several times before I was able to slip it on. But once I did, it stayed in place. My concern here though, is that if you put too much pressure on the Rycote shockmount to get some leverage to close the door, you could crack or break it. There’s also the thin plastic felt cover to the mic itself, which could easily be poked while handling the mic to slide down the door at this time. It’s just a bad design on the battery compartment. But it does work, and thankfully, the battery offers about 70 hours of recording time on a single 9V alkaline battery, so you won’t have to change it very often. By contrast, the battery cover on the VideoMic is on top and is extremely easy to slide of and change out. It also gives you 100 hours of battery power. I’m worried about the Rycote Lyre Mount simply because it’s about 2/3 as thick as the one on the Video Mic, which has a length twice that of the VMP-R. Maybe RØDE decided with regular use that the smaller Rycote sled would absorb the shock just as well, or even better, if it weren’t so stiff. But giving a gentle squeeze, there is a remarkable difference that gives me pause. I don’t think it will break, mind you, but it would long before the larger VideoMic Rycote sled. The VMP also has a coiled 3.5mm minijack, so users can pull it quite a long way to plug it in, should the user choose to bypass the on camera recording for a separate field recorder like the Zoom H4n. This coiled design also keeps the cord out of the way when it isn’t pulled too far. But the VMP-R mic cord isn’t coiled at all, and it’ll only go about 1/4 or even third the distance of the coiled version. It has a nice little slip with which to anchor the cord so it doesn’t get in the way of your camera, however, so that’s something, but I rather prefer the coiled cord. But there’s no denying that the VMP-R has far lighter thanks to its larger cousin, and when you’re shooting handheld at a wedding all day, that extra half pound or so can really make a difference as the day goes on. So I think from that perspective, I have to give a point to the VMP-R.
Moving to the controls, the VMP-R has two sliding buttons, the first being the power Mic ON slide, which gives users the choice of Mic ON Flat or Mic ON HPF (high pass filter) which gives you a range of the mic’s native 40Hz-20kHz to a high pass option of 80Hz. Secondly, the VMP-R has a three position dB level control switch that goes from -10 dB – 0 dB – +20 dB. That gives some nice options when it comes to adjusting to the ambient audio conditions. By contrast, the VideoMic has a single power on button that gives you the choice of Power Mic ON flat and 80 mHZ. So it’s basically the same without the option of adjusting the level attenuation. This makes the VMP-R a better choice for DSLRs, which have terrible preamps that cannot be adjusted. So by altering the gain level through the VMP-R, users can at least reduce the noise generated by the camera’s preamp circuitry. OK, we’re done with the tour of the mic, now we can get to the performance of the VMP-R. It records twin mono channels to the left/right track, rather than in true stereo. That’s nothing new. But it is far more sensitive than the previous model VMP-R, thanks to an enlarged microphone capsule that gives more real estate to capture the audio and thereby have more sensitivity to record it. The sensitivity can really be heard when you’re listening to recordings directly to a DSLR at +20dB. It gets really blown out as the lousy preamps in a DSLR like the Canon T3i simply can’t handle the load. So, if you’re recording run and gun style with your DSLR, I’d advise sticking to 0 dB or -10 dB depending on your audio conditions. But if you’re going to be recording to a field recorder, I found the recording settings to be noticeably higher at +20db, but it didn’t blow out as much. I’d still likely rarely use the +20db setting though, as the 0 dB setting works perfectly in most situations. But I also want to add that when I did a noise test, where I just let the VMP-R record silence to see how much hiss would be invited to the party, I honestly couldn’t hear any. Now to be fair, I’m the first to admit that I don’t have golden ears, so I may have missed it. But based on what I recorded and listened to, there simply isn’t much there, if any. And that’s what is really grand about the VMP-R, this redesign has given the mic such crystal clear performance, RØDE isn’t just hyping that, as far as I can hear. It’s the real deal. 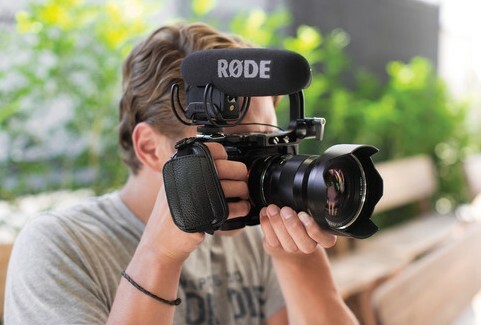 Cost of the RØDE VideoMic Pro with Rycote Lyre Suspension Mount is $249 at B&H. Is it worth it? ABSOLUTELY, with the exception of the annoying design of the battery compartment, I think that if you already have the previous VideoMic Pro, you may still want to pick the Rycote model up. It’s a worthy upgrade, if for no other reason that you don’t have to deal with those silly rubber shockmount bands anymore. But the added preformance from the larger mic sensor really does make a difference in performance. And besides, that’s what eBay is for, right, to sell your cast offs? And if you are looking to get an external mic, now that RØDE has added the Rycote Suspension, it’s definitely the Mic to add to your DSLR quiver. Just make sure you have the right settings. Visit RØDE’s site for more information.